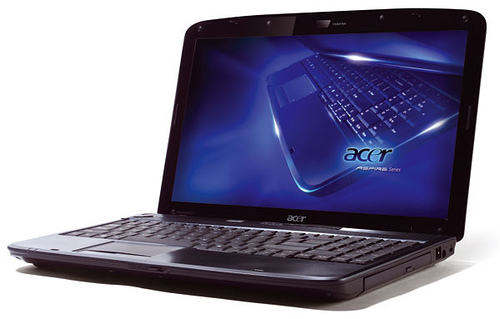 Acer Aspire 5745 Laptop come with Windows 7 64-bit, Mobile Intel HM55 Express, The Laptop lets you enjoy multimedia performance with dynamic sights and sounds. On Aspire® 5745PG models you’ll also have an HD multi-touch screen and customizable Acer® TouchPortal multimedia. The 15.6" high-definition wide display, powerful graphics, optimized third-generation Dolby® Home Theater® audio enhancement combine for a full-on portable-theater experience. The HDMI™ interface conveniently connects you to today's hottest high-definition entertainment systems via a clean, single-cable link. The Intel® Core™ processor offers all the power you need. DDR3 memory keeps the system moving swiftly for efficient media performance and multitasking. You also have a large hard disk drive for storage plus a 5-in-1 card reader. Seamless connectivity will surely enhance your on-the-go digital life. The Aspire® 5745 features onboard Wi-Fi® bolstered by Acer® SignalUp wireless technology for getting online faster and more dependably wherever you roam. Gigabit Ethernet is also on tap if you'd like to go the wired route. You can also engage in live chats with friends across the globe using the built-in high-definition Acer® Crystal Eye webcam plus microphone. The Aspire® 5745 features an Acer® FineTip keyboard with large keys for comfortable typing, while dedicated media keys give you total control over your entertainment. Another special highlight is the multi-gesture touchpad that lets you easily scroll, pinch, rotate and flip through web pages, files and images. Up to 4GB (2GB installed in each of two or four memory slots) DDR3 1066 SDRAMWith Intel® Core™ i7 Mobile Processor: User upgradeable up to 16GB (one 4GB memory card in each of four slots)*With Intel® Core™ i5 or Intel® Core™ i3 Mobile Processor: User upgradeable up to 8GB (one 4GB memory card in each of two slots)* *If upgrading after initial purchase, one or more of the memory cards provided with the system may have to be replaced with optional larger memory cards in order to achieve the maximum capacity. One- or two-year parts and labor limited warranty* with concurrent International Traveler’s Warranty***For a free copy of the standard limited warranty end-users should see a reseller where Acer products are sold or write to Acer America Corporation, Warranty Department, P.O. Box 6137, Temple, TX 76503. TFT displays commonly exhibit a small number of discolored dots, so-called “nonconforming pixels.” This phenomenon is a limitation of TFT LCD technology, not a product defect and, as such, is not covered by the limited warranty or by the upgrade programs. All Driver 2011. Powered by Blogger.